"Empire" actor Jussie Smollett was charged Wednesday with disorderly conduct and filing a false police report. Chicago Police spokesman Anthony Guglielmi said earlier in the day before formal charges were announced Smollett was considered a "suspect in a criminal investigation" for "filing a false police report" — a class four felony. The charge carries a sentence of probation or up to one to three years in prison. "Detectives will make contact with his legal team to negotiate a reasonable surrender for his arrest," he tweeted later. 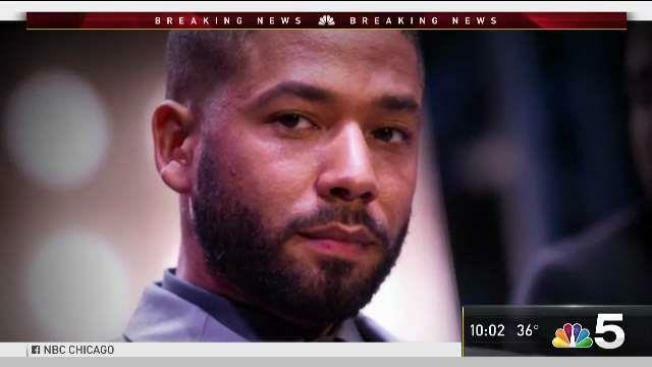 Smollett is expected in bond court Thursday afternoon at 1:30 p.m.
“Like any other citizen, Mr. Smollett enjoys the presumption of innocence, particularly when there has been an investigation like this one where information, both true and false, has been repeatedly leaked," the actor's legal team said in a statement. "Given these circumstances, we intend to conduct a thorough investigation and to mount an aggressive defense." The brothers were interviewed, arrested and later released without charges in connection to the alleged attack on the actor. Chicago police say the brothers are now considered cooperating witnesses against Smollett. A police spokesperson originally told NBC 5 Smollett had been indicted by a Cook County grand jury. The felony charge, however, was approved by the Cook County state's attorney's office.